Free Internet Through specific App by facebook. We cannot send / view / download over 200KB SiZE videos / images / Email. (You cannot download 4MB Mp3 File, even Not view a youtube video, live cricket). No Netbanking & online shopping because HTTPS doesn’t support. We cannot View the website Address original because it written by Facebook. No Interaction with Website Login /Registration and comment. Next click on the website or that page Asks Money for that. Broaband privders hike the plan rates. Maybe we can pay money for downloading App to telecom future. what we do with that Free internet. 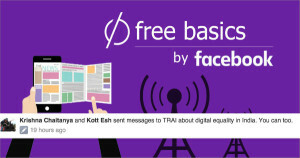 How facebook free basics violates Internet neutrality? Free internet is Below 200KB Served by facebook cache for full access we pay money just like below. from Airtel free google Zone you can access cached version of website by google. if you want to click on the homepage. then you are directly accessing website that makes you charge 1MB for 3 Rupees. Because All the Telecom Companies Planning To follow this method. Display Ads to make money In future not now. becuase Their Terms and Services changed anytime. Internet Neutrality: we can Access all websites with Same cost. we can acces any website for specific recharge of 1GB data. without this you have recharged 1GB ok, you need to pay extra money for popular sites like Youtube, FB, twitter and downloading images other sites which mostly used by world or by you. This App available on Reliance but TRAI ordered Reliance to STOP. “Unitll we approve Diffrenet Price for Different Ccontent by Telecom operates” as said above as internet neutrality or pay for every single element. Sending email 1 email in 100 words 10 Rupees. 200 words 20 rupees. Like Airtel DTH pay per watch movies. we use the Internet for watching news, serials, movies Instead of TV Prepaid recharge. We use SKYpe, WhatsApp, facebook video calling instead of recahrging phone balance. we access free games instead of buying games offline. We download movies / songs free online instead of buying offline. Internet is valuable don’t misuse or oversue this. optical fibers will be damage in next few years. At presnet we buying 300MB 3G data 96 INR By Idea in AP Circle. (So 3 Rupees for 1 MB).